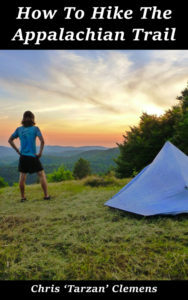 How To Hike The Appalachian Trail is an attempt at a ‘how to’ guide for long distance hiking mixed with a bit of humor and a heavy dose of ‘hike your own hike’ advice, acknowledging that there is no wrong way to do the right thing. Ever wondered what it would take to hike the Appalachian Trail? Beyond the obvious (just go out and do it!) this book is filled with lessons learned over 136 days, 2,184.2 miles, and 13 states. Chris ‘Tarzan’ Clemens left his corporate job, comfy bed, and indoor bathroom in March 2012 to embark on a life changing adventure that would teach him about nature, himself, and outdoor gear. This short read covers the gear that it took to complete the trek. Tarzan has his preferences to carry on the trail, but he also discusses what he learned from other hikers and their experience. Whether you are planning your own 2,000 mile thru-hike, a weekend in the Smokies, or just need need a good laugh, lace up your boots (or shoes), pitch your tent (or hang your hammock), throw iodine in your water (or use a SteriPEN), and start exploring this book.